KastKing Triangle Foldable Net is the landing net to have! KastKing compact fishing net is foldable and retractable. Durable, supple, tangle-free coated fine mesh net captures even the smallest (or biggest!) fish. Its special coating guards against your hook points getting stuck in the net and it will not harm the fish’s scales aiding safe quick release. The fish net coating is non-absorbent and will not get heavy with water. 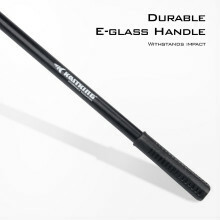 KastKing Triangle fish landing net hoop and handle are made of tough, durable e-glass that withstands impact and will not dent or bend like aluminum. The push button to fold the net is made of very strong, durable industrial nylon material. 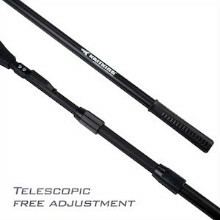 The hand-hold end of handle is made of non-absorbent PVC material. 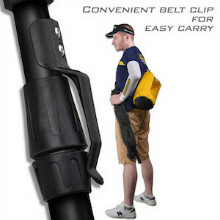 KastKing Triangle fish landing nets have a convenient belt clip for easy transport. All components are non-rusting and saltwater approved. Non-glare finish. Put it in the boat with KastKing Landing Net. KastKing Triangle Fish Landing Nets are great for conservation minded anglers. 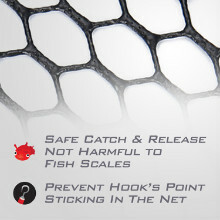 The soft, supple non-absorbent net does not harm a fish’s scales, giving you optimum safe catch and quick release. KastKing Triangle fish net’s coating and fine mesh greatly reduces the chance of your hook’s point sticking in the net. Throw a KastKing Triangle compact fishing net in your boat for freshwater or saltwater fishing. Folding hoop and telescoping handles make storing this fish landing net easy.